Yes, you need to walk your dog all year around. Walking your dog in the winter snow and ice is not only dangerous for you it’s also dangerous for dogs. You need to take some extra precautions during the winter. Weather conditions and the conditions of the areas you walk can put you and your dog at risk of injury. Running and playing in the snow is a great source of exercise for your dog, but don’t ignore the elements. Ice and snow can create very slippery conditions. If your dog slips or falls it could tear ligaments, sprain muscles or suffer a puncture wound. If you think this might be an issue where you walk or play you have several good options. You can purchase nylon or leather boots designed to prevent this problem. Another option is skipping the walk or play session and finding an alternative activity until the area is safe again. Another common problem to be aware of is snow and ice build-up between your dog’s toes and pads. This can be very uncomfortable and Ice can actually cut into the pads or the tissue between the toes. Salt, sand and chemical ice melting products also come in contact with the pads and tissue between a dog’s toes. Some of these products can cause burning and skin irritation. It can also cause sickness when it becomes ingested by a licking dog. Make sure you carefully clean and dry your dog’s feet every time you come in from outside. 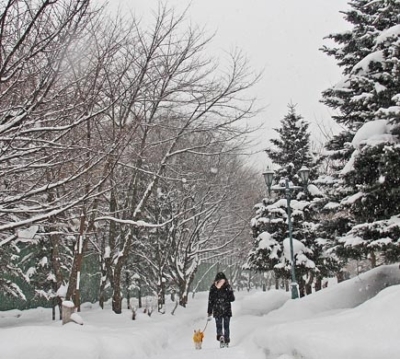 Walking your dog in the winter months will burn more calories much faster. This is because he is using calories to keep warm. If your dog spends time outside you may want to consider feeding your dog more food or a food with a higher level of fat content. Before changing your dog’s diet, we suggest you consult your Veterinarian. If your dog has a single coat or short hair you may also want to consider using a doggie coat or a doggie sweater when walking your dog in the winter. Short haired dogs loose body heat much faster than double coated dogs do. The same should also be considered if you have a small or miniature breed dog. Smaller dogs are more susceptible to colder temperatures due to a lack of body mass. Small and miniature breed dogs are not able to regulate their body temperature as well as larger dogs. Every dog can enjoy the winter months as long as you prepare them for it. Just make sure to you watch them closely. If they get cold easily or appear to be in distress, limit their exposure to the cold and snow. Contact us when you need help training your dog. We provide one-on-one training and personal instruction. Contact Us.